INA Bodrum Araþtýrma Merkezine (BRC) TINA desteði. Warm greetings from INA’s research center in sunny Bodrum, Turkey! I have been here for almost three weeks now, and wanted to update you all on some of the exciting events taking place. I was pleased to see that the Bodrum Research Center (BRC) itself is in great shape and suffered no neglect while Tuba, Ozlem, and Orkan were consumed making the necessary preparations for Virazon II to voyage to Albania last month. The streets of Bodrum are crowded with tourists and summer residents, but the BRC is an oasis of quiet broken only by waves of cicadas chirping in the olive trees. We have a terrific group of four Texas A&M University graduate students currently in residence at the BRC, assisting myself and Cemal Pulak with many different aspects of our ongoing research. We also have a steady stream of scholars in residence, including INA Affiliated Scholar Nicolle Hirschfeld, who is working alongside archaeometallurgist Seppi Lehner on the Bronze Age ingot fragments from Cape Gelidonya, and INA Research Associate Michael Jones, who is here studying some of the hull remains of the eight Yenikapý shipwrecks excavated by INA under Cemal’s leadership; Michael is also a new faculty member at Koç University in Istanbul. Newly arrived this week are dendrochronologists Tomasz Wazny and Brita Lorentzen, who have been delighted by the many tree rings preserved in the Yenikapý hull timbers. 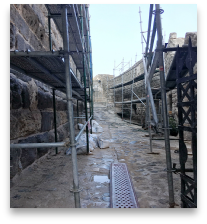 Many of you are aware that the Bodrum Museum of Underwater Archaeology, which we visited during the 2014 INA Board Meeting, is closed for renovation. 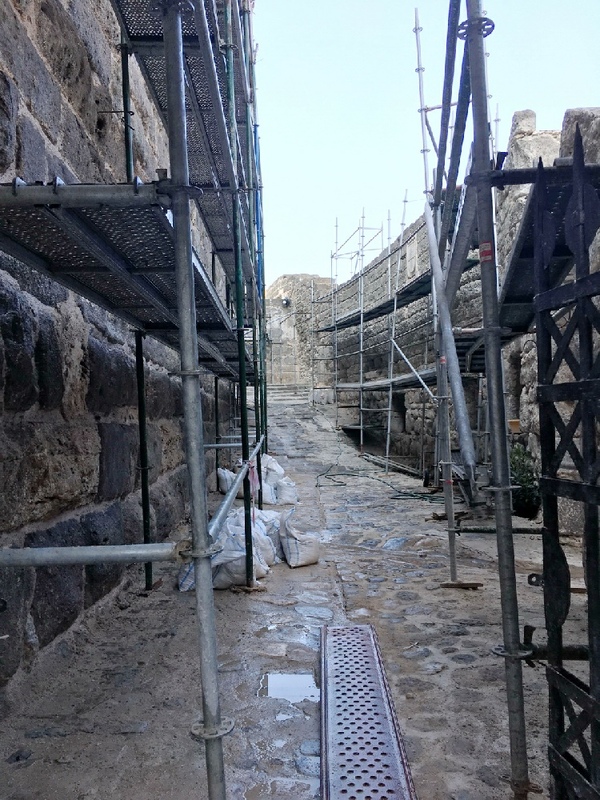 This massive project involves restoration of the 15th-century Crusader Castle’s huge defensive walls, and demolition of numerous more recent buildings, with the ultimate goal being the construction of a single large, modern exhibit hall where shipwrecks will be displayed in chronological order. Current estimates suggest that the project will take 4-5 years to complete. What you probably don’t know, however, is that this summer INA researchers are the ONLY researchers with access to the archaeological material stored in the Bodrum Museum. This is a direct result of Tuba’s superb negotiating skills and our trusted relationship with museum staff, with whom we have been working for decades. So while it can be somewhat overwhelming to contemplate the big changes taking place at the Bodrum Museum, the opportunity to continue our research within the Museum is nonetheless an exceptional gift. On the subject of exceptional gifts, Chairman De Lapa has already informed you about the fabulous new INA Discovery Fund recently established by Lucy Darden and the Darden Family, to whom we owe ENORMOUS thanks! Last week the BRC received more gifts courtesy of our friends at TINA, including four full-size refrigerators, two dishwashers, two washing machines, two microwaves, a dryer, a standalone freezer, an air-conditioning unit, an oven, stovetop, and fumehood, and various other small appliances. These brand new appliances constitute a HUGE improvement to the dormitory and communal work areas of the BRC, and we extend an equally HUGE Thank You to our TINA Directors Oguz Aydemir, Kenan Yilmaz, and Jeff Hakko! Be on the lookout tomorrow for another from-the-field update from INA's team in Albania! With sincere thanks for all you do for INA!